How mindfulness at work may alter your gene expression. Getting your finger pricked at work for a blood sample is not something you’d expect elite advertising execs to agree to. But, on a warm July day in 2015, fifteen members of a premier advertising agency in San Francisco interrupted their busy schedules and lined up in their office to do just that: They each provided a finger-prick blood sample. These were some of the most hard-working minds in the company—partners, directors, managers and team specialists—from operations to HR to creative. Passionate about their craft and desire to impact in the world, they also struggled with some semblance of “work-life balance.” They were eager to learn how to transform their high levels of stress into wellbeing. As I watched the blood samples dry and packaged them to ship to the Social Genomics Core Lab at UCLA, I was overcome with a nervous excitement. These enterprising folks were part of a 12-week pilot study—called Mindful Workday—that I was conducting at their company. 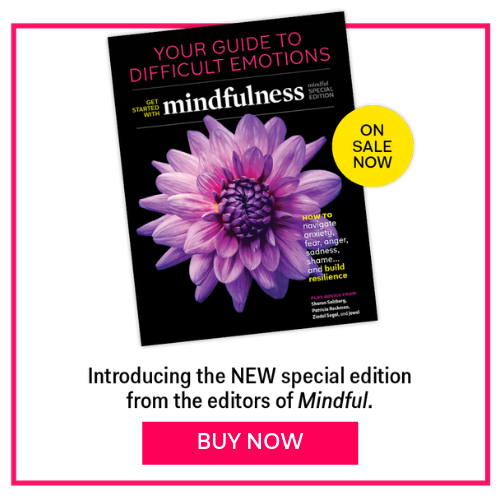 We were taking an educated leap of faith, and hedging our bets on the now well-studied effects of mindfulness to help them increase their focus, develop a better relationship with their emotions, and cultivate their capacity for compassion. I wanted to know what was happening in their cells—at the level of gene expression—before and after they completed the 12-week intervention. Except I wasn’t merely interested in how they reported feeling before and after 12 weeks of mindfulness training (using various scientifically validated self-report scales of wellbeing, resilience and mindfulness). The 12-week experiment consisted of an hour per week of in-person instruction at work, on the science and practice of mindfulness and compassion. They were given access to a digital platform with guided meditations and additional learning content. Most importantly, the instruction focused on everyday skills and behavior changes that could help turn the most mundane of tasks—meetings, walking, eating, breathing—as well as more difficult emotional interactions with coworkers, into more mindful and compassionate ones. Would their genes respond to this change in their lifestyle? As a physician who has moved away from clinical practice to focus on prevention and the science of wellbeing, I have an intense love affair with the relatively new field of epigenetics. Epigenetics (“above” or “beyond” genetics) explores the fact that while the genes we inherit from our parents do not change, how they express themselves in our bodies does, and can be influenced by several environmental factors – including our lifestyle. At any given moment, a gene may either be active or turned “on” or inactive and turned “off”. What we eat, how we move, how much we sleep and how we manage our stress can directly affect this switch, one way or the other. Herein lies the immense power and potential of lifestyle for our health and wellbeing. Though we may inherit a genetic predisposition to various chronic diseases – like heart disease, cancer, diabetes, anxiety, depression, auto-immune disorders, among others – we are empowered through the choices we make each day, to keep those from turning into reality. One of those key sets of genes are ones that code for inflammation in the body. Inflammation is simply the body’s protective response to any kind of toxin or injury. Think of how your skin recovers from a cut, for example – there may be swelling and redness followed by scab formation and finally healing. However, when inflammation is chronic and persistent at the cellular level (e.g. when exposed to the “injury” of daily stress, or eating junk food or staying sedentary), it triggers a domino effect leading up to chronic disease development. Lifestyle-related chronic disease is the leading cause of illness and death worldwide. In the U.S., three out of four us will suffer from at least one chronic disease in our lifetimes and it accounts for more than 86% of our healthcare costs. Stress in the workplace costs the U.S. economy upwards of 300 billion dollars per year with a 190 billion dollar healthcare cost. Despite the popularity of social media, loneliness and social isolation is on the rise, with one in four Americans reporting they do not have even one person to discuss important matters with. Now for the good news: 80-90% of chronic disease is completely preventable when we pay attention to our lifestyle. At Wisdom Labs where I serve as Chief Science Officer, we focus on transforming the workplace from a source of stress to one of wellbeing. We do this by training and scaling a range of practices rooted in the art and science of mindfulness and compassion that help individuals thrive at work. Traditional meditation and mindfulness-based programs, though effective, require a significant time commitment, which often deters their adoption in the workplace. There is a need for programs that are easily integrated by individuals into their workday. In addition, to our knowledge, nobody has as yet studied the effects of such a modified workplace program at the gene expression level. We decided to take on this challenge, partnering with the brilliant and kind scientists from HopeLab in this research effort. Previous pioneering research in this area has focused on the effects of chronic stress and social isolation on a set of 53 genes related to inflammation and immunity (called Conserved Transcriptional Response to Adversity, CTRA). This gene set is expressed in a certain way (with inflammation going up, and immunity going down) when we are stressed and under the “fight or flight” response. A decreased expression of this gene set signifies a healthier outcome for the body in the long run. Other randomized controlled studies in humans have also shown that interventions such as meditation can both suppress CTRA gene expression profiles, as well as improve levels of interleukin-6, a biomarker of systemic inflammation. We designed the 12-week Mindful Workday experiment to build on these findings and see if we could replicate the results in the workplace. Back at the ad agency, on a fall day in 2015, it was time for a second finger-prick blood sample. We had successfully completed our12-week program and everyone waited with baited breath for the results. To do the analysis, we first looked at the average expression of the CTRA gene set for the group, at baseline. We then looked at the average expression of this set of genes for the group, after 12 weeks of doing the program. We then asked the question: does the average expression of this gene set change over the 12 weeks? We found it did! We saw significantly lower expression of inflammatory genes, and greater expression of genes boosting immunity. In addition, the group reported statistically significant improvements in their psychological and social wellbeing, a sign of flourishing. There was also a trend for greater reported sense of connection over 12 weeks, and an upward trend in levels of mindful awareness (the ability to pay attention to the present without getting lost in past or future). Needless to say, these are extremely encouraging and exciting findings for us as they strongly support the program as having made impact within this workplace population. We are also very aware that these are preliminary data within a small sample and an observational study. Much more work lies ahead before we can come to any causal conclusions. Our aspiration as a company is to build on this foundation, work with larger groups in the workplace, and use this data to contribute to the existing body of knowledge in this field. We are one step closer to creating happier, healthier, wiser and compassionate cultures at work. Stay tuned! Look for Parneet on the cover of our April issue, on newsstands March 1st. Parneet Pal, MBBS, MS is a Harvard- and Columbia- trained physician on a mission to create a compassionate society where health is the default. She moved away from clinical practice to focus on chronic disease prevention. She provides lifestyle-as-medicine consulting to academic organizations, business and individuals. She also serves as Chief Science Officer at Wisdom Labs, Inc.